I have been waiting for this machine for 10 years! I weigh 63 kg (but only when my mother-in-law stays with us and cooks). I have flown the Aeros Combat L l3 (13.7sqm.) for the last few years. The climbing was good. But you understand the feeling when your well-fed colleges gradually out-glide you. Uh... What can you do? To carry the 10kg ballast everywhere? No... Seriously, for years it was a problem for light pilots needing performance, for some women to handle, to endure continuous flights, or to do a decent flare. I am not sure if there were really successful small sized competition hang gliders up to now. After our analysis of test flight data from about twenty Combat L12’s sold (by November 2006) we are sure this glider climbs and glides like bigger Combats and in addition, has other desirable features and qualities. It was difficult to start, knowing from experience how hard it is to compel small wings to fly properly. However, we are happy now to give our customers this terrific wing. The Combat L12 was designed by Sergey Drobyshev, our inventive genius. The machine is 12,8 sqm. and was build for people 50-75 kg. The optimum is 65-75kg clip-in pilot weight. The sail cut is uncommonly designed with a thin low drag airfoil profile. 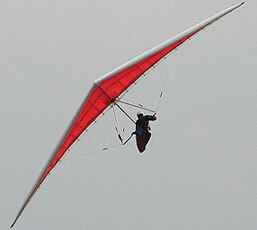 The glider has 24 top battens, 62-50mm 7075 aluminium leading edges, light firm dive struts and design innovation for performance at the highest level. The beautiful and effective wing planform, light resilient outer leading edges and diminished wing tips reduce the wing’s roll inertia, providing excellent handling, slower thermaling speeds and friendly stall characteristics. The wing has a very clean top surface and flawless undersurface. The nose cover blends smoothly into the sail. The modified pulley system with bearings allows you pull VG with 2 fingers. 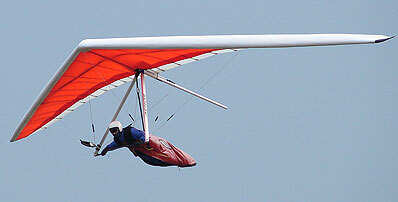 The glider weight is definitely lighter, about 33.5 kg. The Combat L12 is also supplied with all latest innovations. New sailcloth is provided. With the Aeros low drag A-frame you can choose a carbon reinforced speedbar or an aluminium profiled basebar together with all streamline fittings. The uprights are 50 mm shorter than on bigger Combats along with a 40 mm shorter speed bar. You can select from two wire sets: Standard version and second version that keeps the control bar 5 cm back. Optionally the small Combat is provided with all high performance items like light profiled carbon leading edge inserts, 10mm carbon battens and a thin 5.6 m bag. It flew well from the very beginning. The first test flight I did by aero towing. Sergey Drobyshev assured me that our properly prepared wing would fly properly. And it did. The hang point, the bar position, superb handling, stability, the pitch were nearly ideal at the first flight! After a month the glider was available. We invited our Japanese dealer and good pilot Koji Daimon. Koji flew lots of small gliders. After testing the Combat L12 he was happy. He tried different things but after all just asked about a different wire set. Together we compared the wing against the Combat L13 and became assured that the performance was the same. The flying is very similar to the Combat L13. It is nicely coordinated in turns, asking for slight high siding. Like all Combats it is not damped so much like curving tips gliders. This energy machine was build to play in the air. 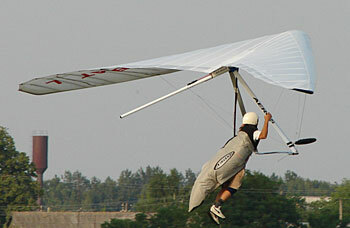 It is not easy to get tired on the Combat L12, the handling is really sweet and it is easy make corrections in rough air. It responds really fast. You do what ever you want with this toy. But at the same time it is predictable and stable. It suits me well. After two days flying with the Combat L12, the Combat L13 seemed to me tight. Another feature we marvel at is that the glider allows slow turns. It feels as though it flies a bit slower than its bigger brothers! [You know, we are still not happy about the Discuss 12 stalling characteristics. It stalls 3-4 km/h faster than should and requires additional speed in turns. For the moment we suggest customers order a Discus 13 (the same12.8sqm), also the perfect wing from the very beginning.] The Combat 12 handling with VG is also better than on bigger wings. We set the trim speed at about 34 km/h and with 70%-100% VG it goes to 40-45 km/h. Then at all speeds you have a light confident positive pitch and what I like is that it increases just a little bit during the fastest of glides giving a safe and comfortable feeling. The A-frame position lets any short arms pilots to do a decent flare. I do not need to push full arms now. It stops a bit before. And the same technique is useful: 1/3 VG will help you to do perfect landings in still conditions. Another good sign was that all these first twenty Combat L12 are very similar to each other. They were easily tuned up. The Combat L12 is very sensitive to adjustments. It is often enough just to twist the tip cap 2 mm (half of one adjusting hole) to correct a turn. Test the glider now at your nearest dealer! We would be happy for you tell us your impressions. We wish you to enjoy your flying, another vital factor in doing well in competitions.